Can you walk on the Pacific garbage patch? 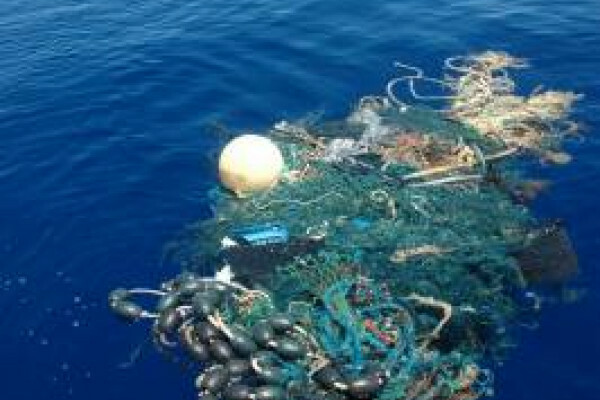 Can you walk out on the Pacific garbage patch? And what's the problem if fish eat plastic? Miriam Goldstein and Rebecca Asch from the Scripps Institution of Oceanography explain why plastics are such a problem in the oceans, and the results of the SEAPLEX mission to find out what effects it might be having on wildlife. Miriam - There's actually areas of the ocean where there's more plastic than other areas of the ocean and those are the subtropical gyres. So people might have heard of the Pacific Garbage Patch or the Atlantic Garbage Patch and those exist because those are natural areas where currents come together. Miriam - The main surprise that we saw that there's just so much of this little plastic crumbs out there. So when you look at the ocean it actually just looks totally normal. It's a really nice blue colour, it's pretty, it's water, it's very pleasant to be out there, the sunsets are nice. And it's only when you start looking more closely that you see all the trash. So you'll see objects floating by the boat every couple of minutes, like buckets or pieces of net, and then when you put a very fine meshed net in the water that catches things that are only a third of a mm, so that is the width of your fingernail or so, then you see these thousands upon millions of tiny particles. So you can see here in this jar, these larger pieces of plastic that are a couple of inches or a couple of cm, and then they're mostly just unrecognisable crumbs. There's no way of telling what the objects once were. And if you look at the bottom of the jar, underneath the big pieces, you can see how small they get. They're just very very tiny crumbs that almost look like sand. The reason that these are so small is that plastic become brittle under UV light as the plasticisers leach out - the chemicals that make it flexible - and those are substances you might have heard of like BPA or phenols. They leach out and the plastic becomes brittle and then it's moved around by the waves and comes into these tiny crumbs. So one lost object can make lots and lots of microscopic crumbs of plastic. We found that we really didn't have to do statistics. Things in the ocean aren't everywhere. Sometimes you find a lot of one thing and you can't find any of the other thing, but the plastic is everywhere. And that's what really surprised us. Miriam - The animals that we know about mostly are the ones that are larger and come to shore. We know for example that albatrosses eat it and they feed it to their chicks. We know that because they nest on shore. We know that sea turtles eat it and sometimes die from intestinal blockages. Again we know that because people notice when sea turtles die and also they come to shore. But for the animals that spend their whole life in the ocean particularly the small ones we don't know very much at all. Miriam - we were trying to figure out how plastic was interacting with the little animals at the bottom of the food chain. So we were collecting water samples for bacteria and for phytoplankton, the microscopic plants, net samples for zooplankton which is the very small and sometimes microscopic animals, big nets or relatively big nets for the small fish. And then we also had observers onboard looking at sea birds and cetaceans, or marine mammals. As well as visually counting trash. Rebecca - We basically collected these fish using a variety of different types of net trawls and brought them back here and dissected them to see if they had ingested any plastic. And our main finding was that we did find plastic at about 9% of these fish. Rebecca - first of all I'd like to say that the number that we should be getting is zero because plastic isn't a natural food for these organisms. Rebecca - we did some calculations on given the number of fish that we caught and given the size of the area where you have plastic and how many fish there are in this area we conducted and extrapolation and what it came out to was that I believe it was 12-24,000 tonnes of plastic ingested by these fish per year. Helen - This is made more worrying as one area of concern with ingesting plastics is that they act as a sponge for chemical pollutants like PCBs, which are harmful to wildlife. Miriam - the worst part about them is that they bioaccumulate so that they get stuck in organisms fat and so they build up to very high levels in the predatory animals like seabirds and whales and so forth. But it is a matter of concern whether eating these plastic particles transfers a huge load of chemicals into these organisms. People are working on that right now. And a possible next step could be to look at plastic ingestion and bioaccumulation of these pollutants further up the food chain. Helen - But is there anything the public can do to help? Miriam - the main thing about this issue is to stop putting trash into the ocean. And that sounds really obvious but actually we're really bad about that. Here in Southern California we have a Mediterranean climate which means that it only rains in the winter. We throw trash into the canyons all year round and then as soon as it rains all that trash from months and months just gushes right on into the ocean and eventually goes in fact to the garbage patch, probably. So by disposing of your own trash properly and by helping to dispose of trash that was perhaps not yours but is headed to the ocean and participating in beach clean ups everyone can help. So, to help reduce the plastic waste problem we should try to help clean up our local beaches, and be careful how we dispose of our rubbish.